Like most of you, my job requires me to spend a significant portion of my day sitting at a desk in front of a computer screen; often times on the phone. These repetitive motions wreck havoc on our bodies, leaving us with tight muscles and severe joint pain. A simple fix for this is stretching: yet how many of us do it? I for one am guilty of not stretching as I should. Recently I've been experiencing severe neck pain when on the phone and have not been able to get any relief. Lucky for me I have friends in "high" places, an ergonomics company, that just came out with an enhanced e-book on this topic. 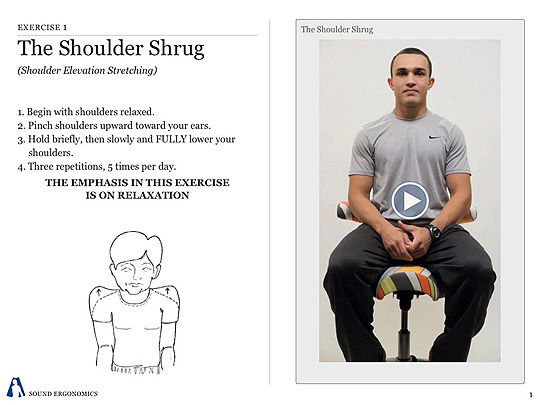 "Stretching Routines for a Healthier Work Day" by Sound Ergonomics is not your normal exercise e-book. It's enhanced to include videos of live models performing each exercise; making it much easier for the average person to follow. The great thing about these stretches is that every one can be done just about anywhere...no special equipment needed. It's been nice having stretches I can perform right at my work station whenever I need a bit of tension relief. I know I need to make stretching a daily habit and this book has made it easy for me. Stretching Routines for a Healthier Work Day is a great resource to have and thanks to Sound Ergonomics I am able to give one lucky reader a copy of this wonderful e-book (available only for the iPad). Additional books can be purchased directly from iTunes.